There's nothing quite like a bowl of hot chicken soup on a cold winter day! This soup is very easy, and the only time consuming part is the prep, but if you do that ahead of time, this soup will come together in almost no time. It also tastes quite a bit better than your standard chicken soup out of a can with the extra flavors that the mirepoix brings to the table. The grains help fill it out and make for a more satisfying bowl of soup! And, like most soups, countless variations can be made, from changing the meat to going vegetarian to using different vegetables, etc. 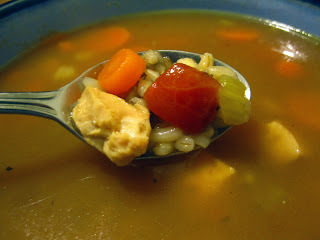 This warming chicken soup flavored with a mirepoix and filled out with grains is sure to warm you up on a cold winter day. rice I used a combination of wild, white, and brown. Boil together chicken, stock, grains, and seasonings (if desired). Soup is finished when all grains are cooked.